Authorities ordered more than 10,000 people to flee from "catastrophic" wildfires in north-east Australia, as heavy rains in the south-east caused flooding that left at least two people dead. In the state of Queensland, a heatwave and strong winds fuelled a massive fire that destroyed homes and led to the evacuation of all 8,000 residents from the town of Gracemere. 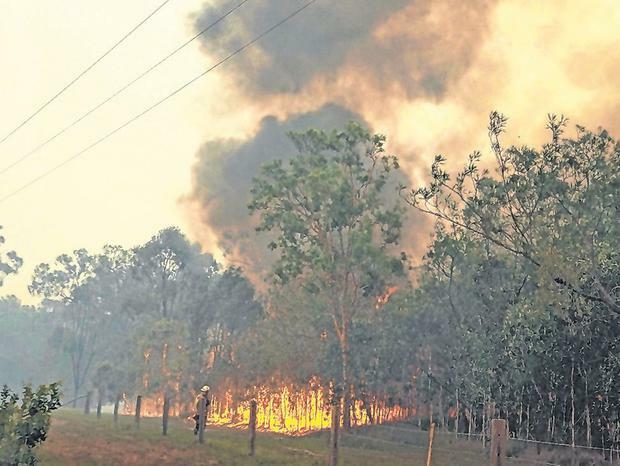 The fire was threatening the larger town of Rockhampton, about 9km away, with about 80,000 residents. The Bureau of Meteorology declared a catastrophic fire danger in the region, the first time such a level has been applied in Queensland. About 200 fires were burning across the state. Some started several days ago following a period of unseasonal dry and windy conditions. It was not clear last night whether there had been casualties. In some areas, police warned people who refused to evacuate their homes that they could "burn to death". "You need to think really hard about not losing a house, but losing the people you care most about," said Deputy Police Commissioner Bob Gee. Queensland Fire and Emergency Services said aerial tankers had released water on the blaze near Gracemere and helped to "suppress" it. As the fires continued, residents in Sydney, about 1,500km south, were cleaning up after a violent storm that caused flash flooding and turned roads into rivers. The city centre received a month's worth of rain in two hours.